There is no negative marking in NUMS test. NUMS test is one of the toughest medical tests of Pakistan and every year there aggregate is very high, reason being students from all over Pakistan can apply for this test. Students who wish to secure a seat in medical collages affiliated with NUMS need to work very hard and should give their 100% for this test. Pakprep.com have a proper solution for this, we have more than 15000 solved MCQ’s along with explanation and smart analytics. We have more than 500 successful students from last year who got admission in their dream collages after preparing from Pakprep.com (to start your preparation today CLICK HERE). Pakprep.com also help students to manage their time in NUMS test, we have past papers and MOCK test which will help students in managing their time more efficiently. 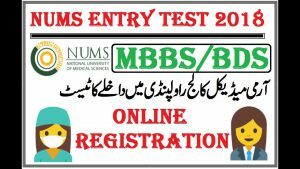 This entry was posted in NUMS and tagged ABOUT NUMS, answers key for NUMS, How to fill application Form for NUMS, how to get NUMS roll number slip, How to prepare for NUMS admission test, NTS NUMS, NTS NUMS Admission, NUMS, NUMS 2018, NUMS Admission, NUMS admission test 2018, NUMS BDS, NUMS BDS Admission, NUMS Biology MCQs, NUMS Biology MCQs with answer, NUMS Biology MCQs with answers, NUMS Biology MCQs with explanation, NUMS Biology MCQs with solution, NUMS Chemistry MCQs, NUMS Chemistry MCQs with answer, NUMS Chemistry MCQs with answers, NUMS Chemistry MCQs with explanation, NUMS CRITERIA, NUMS English MCQ's, NUMS English MCQ's with answer, NUMS English MCQ's with solution, NUMS Entry Test, nums entry test preparation, NUMS MBBS, NUMS MCQS, NUMS Pastpapers, NUMS PATTERN, NUMS Physics MCQs, NUMS Physics MCQs with answer, NUMS Physics MCQs with explanation, NUMS Physics MCQs with solution, NUMS solved papers, NUMS tenth merit list 2018, nums test, NUMS test format on October 12, 2018 by Pakprep.com Admin. Army Medical College (AMC) announced tenth merit list for MBBS and BDS admissions for 2017-18 session. 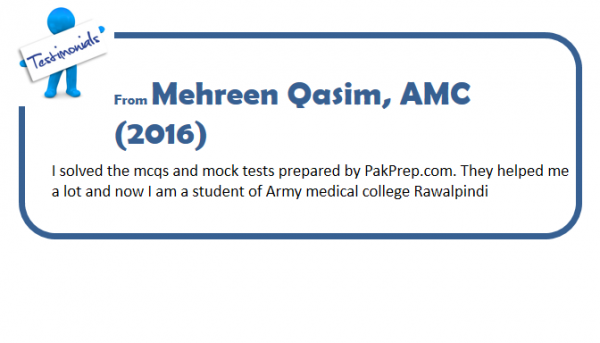 In tenth merit list the lowest merit for MBBS is 88.0180 and lowest merit for BDS is 87.9561. www.pakprep.com provides complete material for the preparation of AMC/NUMS. We have more than 15000+ MCQ’s with answers and explanations. Click here to start your preparation today. Here is the tenth merit list of AMC. This entry was posted in Army Medical, NUMS and tagged AMC, AMC 2017, AMC 2nd merit list 2017, AMC 8th merit list, AMC Admission Form, AMC admission form 2017, AMC Admission test 2016, AMC answer key 2017, AMC Application form, AMC BDS Merit list, AMC Biology MCQs, AMC Biology MCQs with answer, AMC Biology MCQs with answers, AMC Biology MCQs with solution, AMC Chemistry MCQs, AMC Chemistry MCQs with answer, AMC Chemistry MCQs with answers, AMC Chemistry MCQs with solution, AMC Entry Test, AMC Fifth Merit List, AMC Foreign seats, AMC Foreign seats merit list 2017, AMC Merit list 2017 2018, AMC Past Papers, AMC roll number, AMC Tenth Merit List 2017, AMC Tenth Merit List for BDS, AMC Third Merit List 2017, AMC Third Merit List for MBBS, How to Apply for Army Medical College (AMC), How to prepare for AMC admission test, NTS NUMS, NTS NUMS Admission, NTS NUMS Test Answer Key 2017, NTS NUMS Test Answer Key s, NTS NUMS Test Answer Keys 2017, NTS roll number slip for NUMS, NUMS, NUMS 2nd me rit list, NUMS 2nd merit list, NUMS 2nd merit list 2017, NUMS Admission, NUMS admission 2017, NUMS Admission form, NUMS Admission test, NUMS Answer Key, NUMS answer keys 2017, NUMS BDS, NUMS BDS Admission, NUMS BDS Admissions, NUMS BDS Admissions 2017, NUMS Biology MCQs, NUMS Biology MCQs with explanation, NUMS Chemistry MCQs, NUMS Chemistry MCQs with answer, NUMS Chemistry MCQs with solution, NUMS English MCQ's, NUMS English MCQ's with answer, NUMS English MCQ's with explanation, NUMS English MCQ's with solution, NUMS Entry Test, nums entry test preparation, NUMS MBBS, NUMS MBBS Admissions 2017, NUMS MBBS Merit list, NUMS MBBS Merit list 2017, NUMS MCQS, NUMS MOCK test, NUMS Physics MCQs with solution, NUMS solved papers, NUMS tenth merit list 2017, nums test result 2017 on December 29, 2017 by Pakprep.com Admin.